Ian Poulter has found a way to shine on the golf course without winning a major yet in his career. With a little more research at the prompting of some of my co-workers, there’s in fact a few more golfers who have made a splash on the golf course, and not with the the one-stroke penalty. Back in the day, a fellow named Doug Sanders was known as the “Peacock of the Fairways” for his eccentric wardrobe. Sanders played primarily in the 60s and 70s, and used some of the same loud colors Rickie Fowler uses on the golf course. Overall, Sanders’ dress wasn’t as eccentric as some of the modern golfers, like Fowler, who have decided to shake things up. There are two players from the 90s and 2000s who immediately come to mind. Jesper Parnevik, who might now be known as the guy who introduced Tiger Woods to his ex-wife, always wore his hat in a most interesting fashion. I never understood why the Swede decided to flip up the bill on his hat, wouldn’t that defeat the purpose of a hat by letting the sun in his eyes. Parnevik also wore some nice neon colors on his sweaters and pants while out on the course, however, he never really got the following that others have seen since he wasn’t exactly a star on the PGA Tour. Iam Poulter has also gotten his name out there with more than just his golf game in recent years. The English golfer, who was also one of the first athletes to take to Twitter, has shown his national pride (among other tributes) with the patterns on his pants. 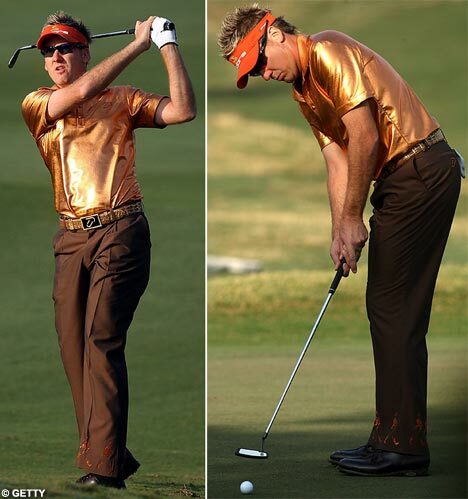 Poulter has the personality to go along with his eccentric dress, making him one of the most popular golfers worldwide. Just ask his 1,247,310 followers on Twitter.